Moodboard: In a stark cavernous show space pulsating with the beat of techno music, Sportmax’s models stormed the catwalk in pieces that defied categorisation or occasion. The Sportmax woman is insouciant, carefree and energetic, pairing her pieces on the go. 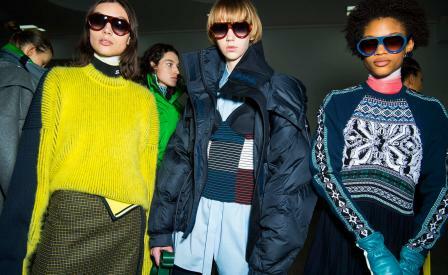 For A/W 2018 she wears colourful Alpine knits with cropped puffer jackets and stompy Chelsea boots, performance wear with plaid trousers, a pleated skirt with BMX gloves and a surf top. Easy breezy Italian chic. Best in show: In a mélange of styles, a striped dress came with a corset-tied neckline – a blend of sports and bohemia. Elsewhere, a nipped-in plaid jacket was finished with distinct block panels of colour, while a sequined sweater and matching tube skirt made for pared-back party wear. Finishing touches: An array of leather bum bags and phone holders which hung from the neck, had all the hands-free ease the Sportmax woman wants. Thick motorcross gloves and aviator shades had adventurous outdoor’s appeal.